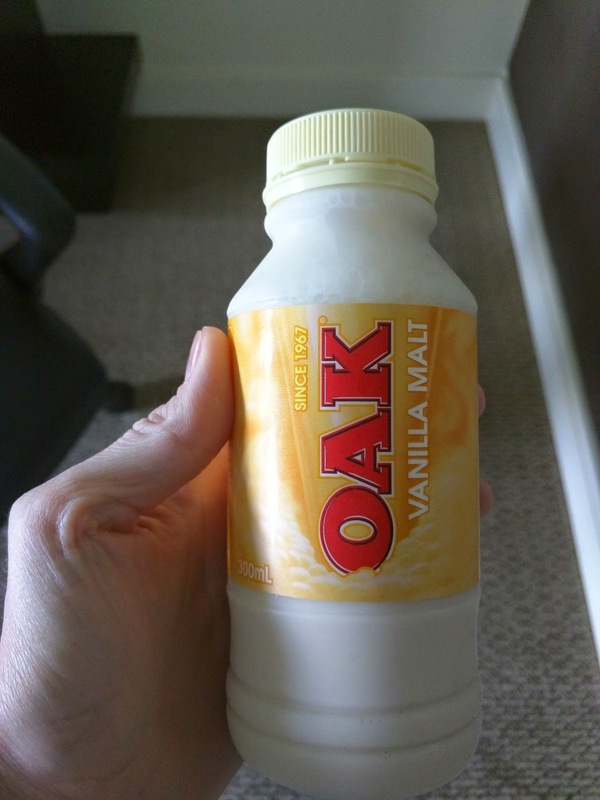 OAK is a brand of flavored milk sold throughout Australia, available in a slew of varieties: chocolate, coffee, strawberry, vanilla malt, banana, and seasonal egg nog. They also make "no added sugar" and "light" versions of a couple of the flavors, but most are full cream, full fat, very sugary, beverages. Flavored milk may seem like a strange thing for me to review, except, you see, I have a weakness for flavored milk. All through high school, I always had Carnation Instant Breakfast on my way out the door. I could never decide which flavor was my favorite. Some days it was chocolate malt, others it was strawberry, and sometimes, even vanilla. I strangely never got sick of it (at least, that is my memory). I had a shaker thing to mix it up in, so it got all frothy ... mmm, almost like a milkshake! Anyway, back to OAK. The office I was working at in Sydney had fridges stocked with these milks, and I got a bit addicted. Sydney tends to bring out my inner child, as I revel in the ice cream treats, chocolates, and apparently, flavored milks. 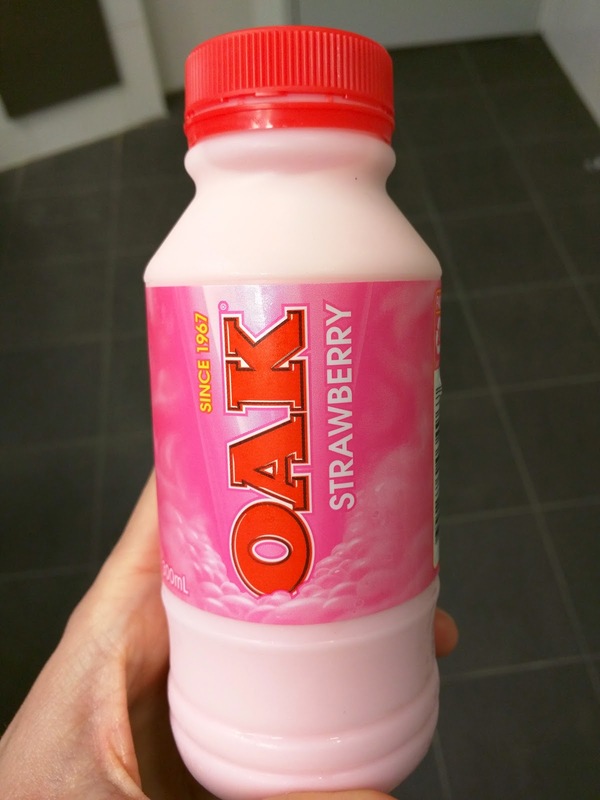 If you happen to be in Australia, and like flavored milk, I recommend! I started with the strawberry. It was quite sweet, and tasted like fake strawberry ... but I liked it. I totally reminded me of Carnation Instant Breakfast, although a far less healthy version. I had this flavor several times during my visit, and every time, I really liked it. And every time, I thought it tasted fake, but that wasn't a turnoff. Sometimes .... fake can be good. Next, vanilla. Well, not just vanilla, vanilla malt. Even better. The first time I had one, I thought it was sweet, a bit malty, and quite tasty. But the next time I really didn't like it, it was too sweet and I didn't care for the thickness. I guess I'm fickle? I also liked this. Yes, it was just chocolate milk, but I liked it more than the Nippy's version (the other brand of flavored milks the office had). This was far more chocolatey. During my recent trip to Sydney, a friend offered to pick Ojan and I up and take us out of the city, to enjoy lunch near the water at Watsons Bay. Given the forecast for 80+ degrees and sunshine, we eagerly accepted. Of course, we could have taken the ferry to Watsons Bay, but it was actually nice to drive there, and get to see some of the other suburbs. Let's just say, there are some people with very big, very nice houses near the waterfront! Anyway, we arrived at our destination, to be met with a big challenge: parking. Sigh. It seemed as if everyone had the same idea as us, and every parking lot and every side street was completely full. We circled forever, and eventually managed to snag a spot. But then we met an even bigger challenge: seating. 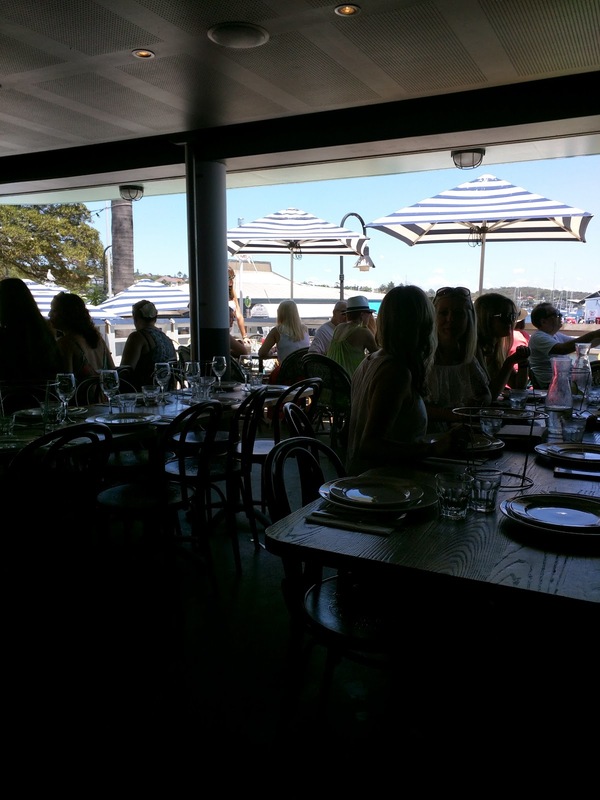 Watsons Bay Beach Club is absolutely huge, with most seating outdoors along several decks. But every table was taken, and the ones that weren't all had reserved signs on them. Protip: call ahead and reserve! It also seems to be a venue of choice for large birthday parties, wedding parties, bachelorette parties ... there were tons of groups all with reserved sections and large group catering. Next up, ordering. This is a very casual place, so all orders are done at a bar, where you pay and receive a buzzer, then go back to wait at your table. The pickup location is on the other side of the massive space, near the kitchen. Silverware is in buckets on the tables, self-service, yet seemed to be constantly running out, so everyone was stealing silverware from each other's tables. Someone does come around to bus tables eventually, but other than that, there is no service. If you can't tell, the whole place is a bit chaotic. It is loud, it is crowded, and it really just feels like a big beach party. Which is perfectly fine on a hot summer day, but don't come here expecting a relaxing beachfront setting to catch up with friends, which is somehow what I was picturing. 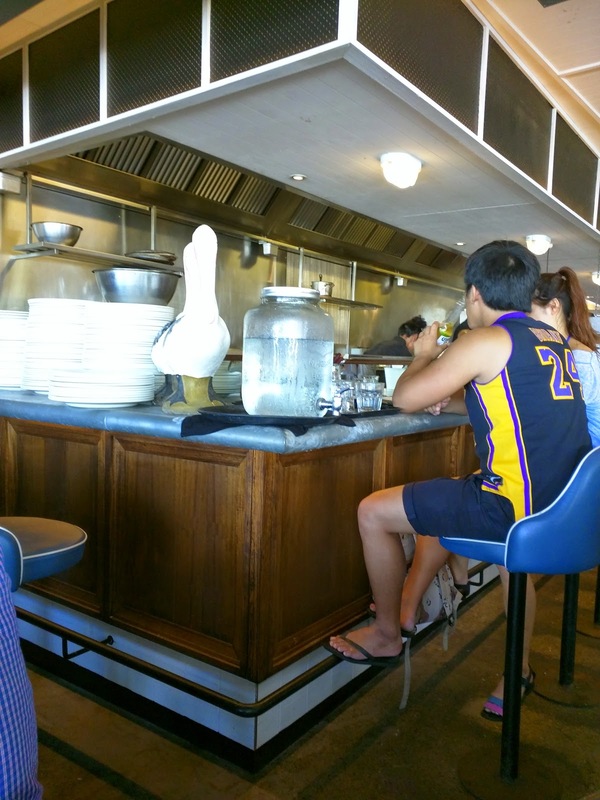 Busy Open Kitchen, Small Counter Dining. As for the food, the menu is mostly seafood, fitting for the location. They have chilled seafood platters, but fish & chips seemed to be the most common order. The food wasn't very good, but the cocktail list was extensive, and the drinks seemed to be free flowing, which is all most people seemed to care about. Ice cold beer or pitchers of cocktails on a hot summer day certainly have their place! 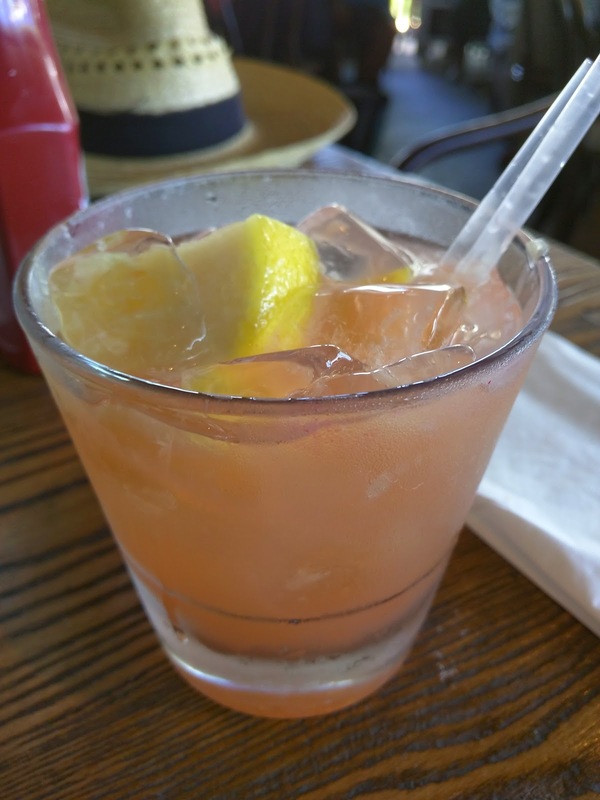 "A summery twist on the classic, served with tequila, cointreau and pink grapefruit". A hot summer day warrants a cool cocktail, right? Watson Bay Beach Club had a bunch of cocktails, but most seemed very fruity, and not quite what I was wanting, as I was desiring something refreshing. In fact, I mentioning one that sounded appealing to my tablemates, and said I hoped it wasn't too sweet, and a server overheard me and told me it was very sweet. I'm glad she did, otherwise I would have been quite disappointed. I wanted something refreshing! My pick of the grapefruit margarita was perfect, fairly refreshing, the tart grapefruit wasn't sickeningly sweet. I appreciated the chunks of grapefruit inside that I was able to eat once my drink was gone. I didn't actually taste any tequila, which I did want to taste, but I uh, sure, felt it, so I know it was in there somewhere. Overall, a fine drink, good for the hot weather. Kids Fish & Chips. $10. There was one problem however, that I didn't foresee: the regular portion is served with a cup of tartar sauce, but the child's size is not. 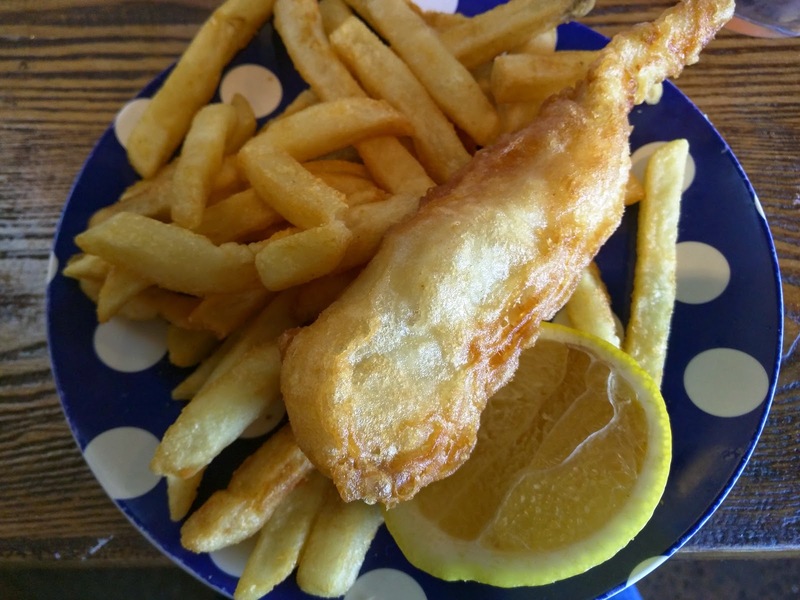 The real appeal of fish and chips for me IS the tartar sauce, so this was a big deal. I quickly went to the counter to ask for some, and it was quickly handed over, so, crisis averted. The batter on the fish was fine, but it was all a bit too greasy and oily for my liking, and the breading fell off easily. The fish was flaky white fish, I'm not sure what kind, but moist enough and not fishy. The fries were very generic; not particularly crispy, not flavorful, not anything. The tartar was equally unremarkable; as a sauce girl, I certainly needed it, but this wasn't a great version. Overall, highly mediocre. The kid's size portion was fine for me, and a good deal for $10, particularly compared to the full size version. 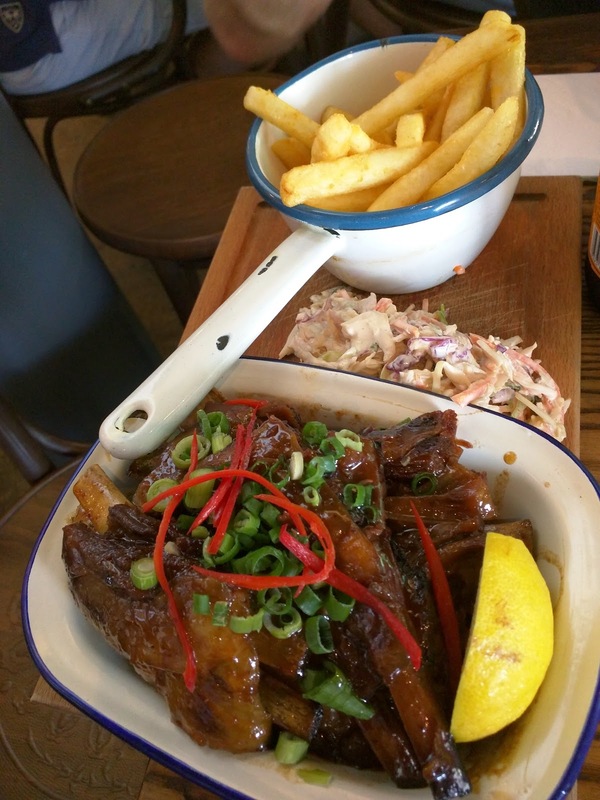 Finger Licking Sticky Lamb Ribs / honey hoisen glaze / old bay fries / slaw. $29. Ojan went for the lamb ribs, since he likes lamb, and we never get it in the US. I encouraged this order, because I had my eyes on the slaw that came with it. The slaw was interesting in that it was a bit spicy, but otherwise, it was just slaw, and was very overdressed. Since I hate lamb, I wasn't planning to try to the ribs, but Ojan said I might like them, due to the honey hoisen sauce they were slathered in. He said they were basically candy. And I'm trying to get myself to like lamb, so I figured if I was going to like it anywhere, Sydney would be it, and smothered in sweet sauce was more likely to make it succeed. He was right, in that I liked the sauce. I ended up dipping a bunch of my fries in the ribs sauce once my tartar sauce ran out. But the ribs? Um, still lamb, so I didn't like them, but he polished them off and continued to rave about them for the rest of the trip. The fries were totally unnecessary though, as he was too busy with the ribs to care about them, and everyone had piles of fries left over anyway. "The World's Tastiest Dumplings". That is Din Tai Fung's claim to fame, and quite the claim. 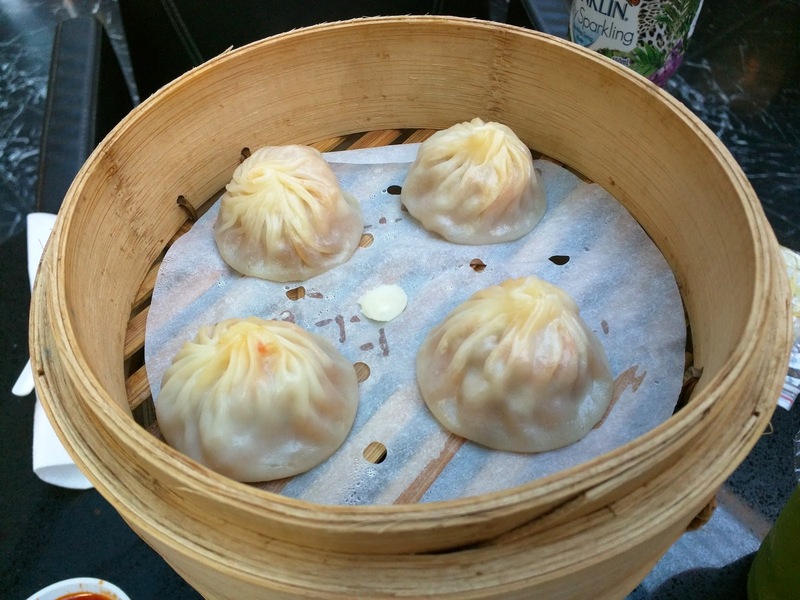 They serve a large variety of dumplings, although the xiao long bao are their signature item. I somehow hadn't heard of Din Tai Fung until my recent visit to Sydney. 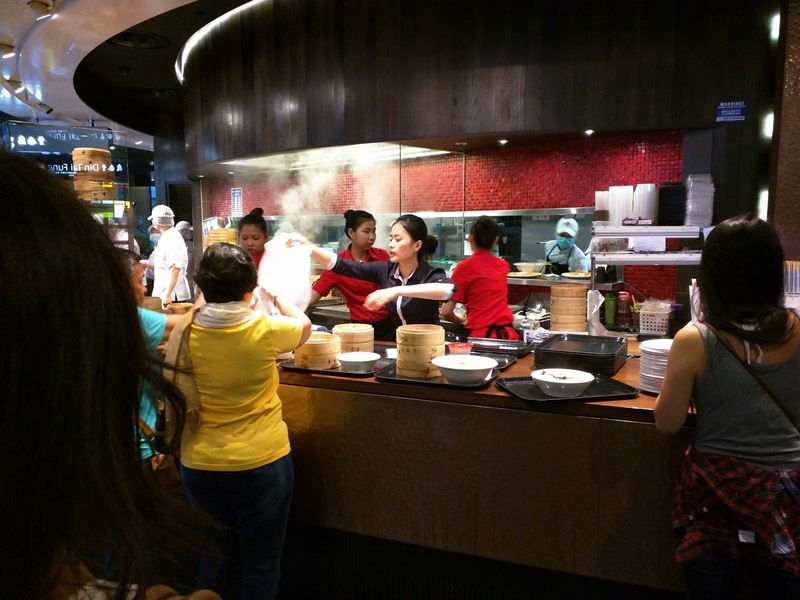 Din Tai Fung is a chain, started in Taiwan, with locations worldwide, including China, Japan, Malaysia, South Korea, Thailand, and the US, amongst others. Two of their locations in Hong Kong even have received Michelin stars. They have 3 locations in Sydney alone, one is a full service restaurant, and the other two are part of food courts, one at the Star casino, and the other at the Westfield mall. I visited the Westfield mall location, which, while part of a food court, isn't your normal style establishment. They still make all dumplings by hand, to order, although the menu is reduced. The location was crazy, crazy busy. The line was long, but that provided ample time to fill out the paper ordering form provided. Once we reached the head of the line, we handed over the form, the cashier confirmed each item one by one as she keyed it in. It didn't seem any more efficient than just ordering directly. Unfortunately, we really didn't like anything we tried. Some of the food was hot, some lukewarm. I'm assuming the quality issues were due to the location we picked, rather than being a chain-wide issue, because, how else would they possibly have Michelin stars? I'm open to trying another, non-food court, location sometime, but I won't go rushing back. Even in the food court setting, the kitchen is open, so you can watch food being prepared. After ordering, you are given a buzzer. It took us less than 10 minutes to receive our order, which was longer that I expected for a food court, fast-casual establishment, but, they do make everything to order, so, that matters. The self-serve condiment station had plates, spoons, chopsticks, packets of ginger, soy sauce, chili sauce, and vinegar. While Ojan waited with a buzzer for the food, I set up a table in the open food court, and set about mixing up my perfect dipping sauce. I appreciated these components. 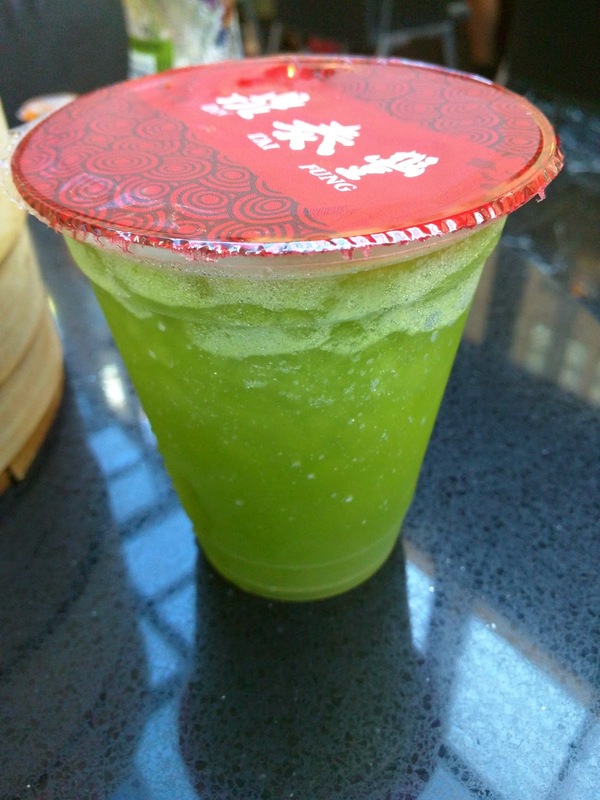 Reviews I read recommended the Lychee Mint Freeze as a perfect drink to go along with the food. Not something I'd ever normally order, but I went for it. I really didn't like it. It was just a sweet syrup, with some mint flavor, in an icy slush. The slush was nice, but it was just far too sweet. There was a prize lychee in the bottom that I enjoyed. $5.80 was a high price for a drink. Crab Meat and Roe with Pork Dumpling. $9.80. 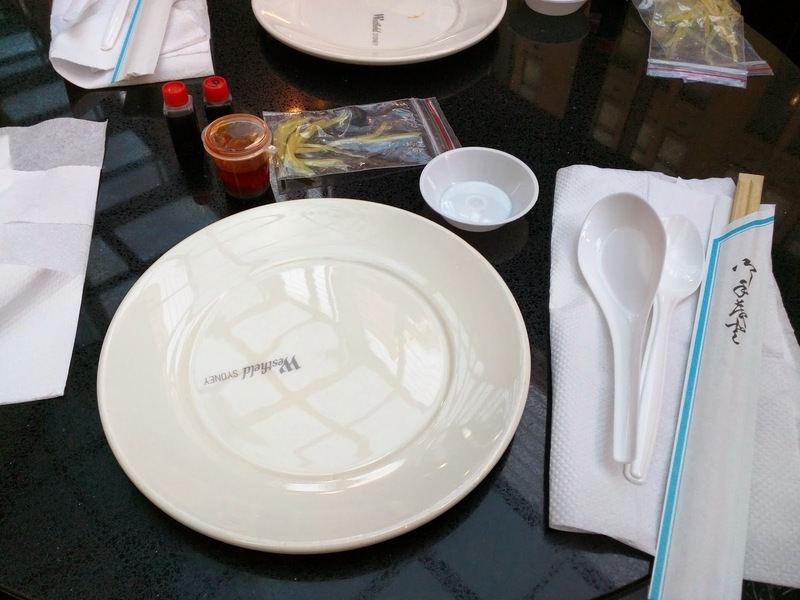 We started with the item Din Tai Fung is most known for: Xiao Long Bao, available in many styles. I had my eye on a special crab version, available only on the menu for the larger, full service restaurant in Haymarket, but not on the online menu for the Westfield location. 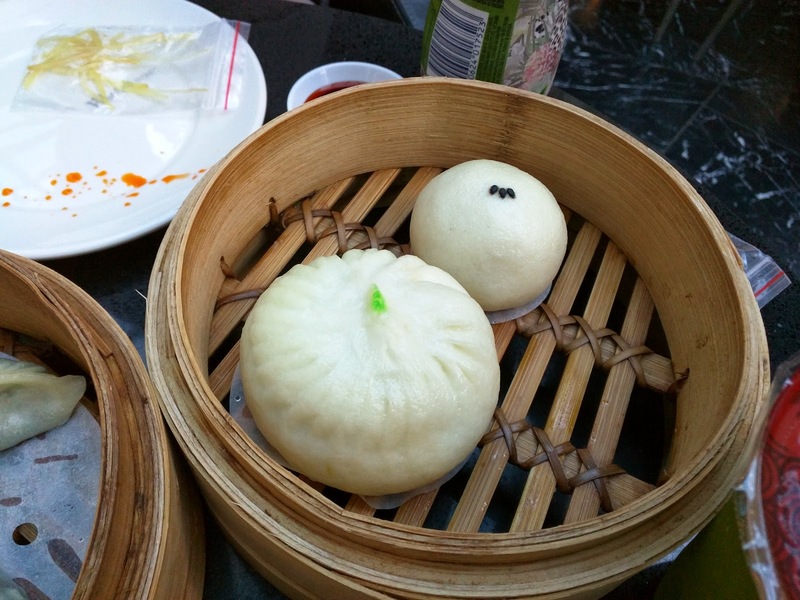 I didn't think we'd be able to order them, and would have to settle for classic xiao long bao. I was thrilled to see them on the menu at the mall, because crab is one of my most favorite ingredients. But ... these weren't very good. First, they were lukewarm. Second, they didn't actually have any soup inside. What is a soup dumpling without the soup? And third, I didn't taste any crab. Sigh. How could they go so wrong with a signature item? Things were not looking good. The price was also a bit high, although they are double (!!) the price at the Haymarket location, so I guess this was reasonable comparatively. Steamed Vegetarian Jiao Ze. $5.80. We wanted more dumplings, and there were very few choices, so we selected the regular vegetarian ones. 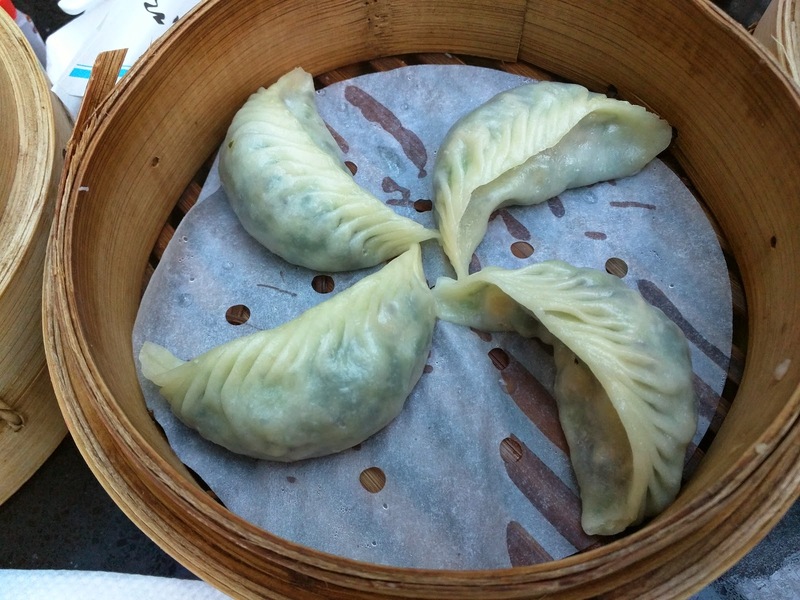 We weren't sure what was going to be inside of them exactly, since the menu just said "vegetarian", but I do tend to love vegetarian dumplings, particularly snow pea or mushroom, so I was hopeful. The dumplings were hot and fresh, the skins nice enough. Much better than the lukewarm xiao long bao. But, I hated the taste of the filling. It was a mix of assorted veggies and tofu. It was bitter and mushy and just not flavors I enjoyed at all. The price seemed a bit high compared to other items, $5.80 for the four. Vegetarian Bun. $2.80. Mini Sweet Bun (Black Sesame). $1.90. The final savory item we picked was a bun. Since the prices were low, I was skeptical of the pork option, so we went for veggie, the only other choice. I really didn't like it. The dough was just ... doughy. It wasn't slightly sweet, it wasn't ... anything. Just there. The filling was the same as in the dumplings, and I again disliked it, although this time it was even worse, as it was in greater quantity. The $2.80 price was fine for a large item, but I didn't even want to swallow a second bite of this. Of course, I was also really excited for the desserts. I wanted everything taro. I love taro, and Sydney is filled with it. I quickly picked the fried taro dessert for one of our options, and then decided to mix it up with a sweet bun, and pick something else for the filling. My options were taro, red bean, and black sesame. Black sesame sounded the most unique, so I went with it. The bun seemed exactly the same as the vegetable bun, not sweet, which I really wanted for a dessert bun, and again not very good. The black sesame filling was slightly sweet, and good enough, and it was probably the best item we got, but it still wasn't great. $1.90 for a small bun was fine. Golden Taro Bread, 2 pieces. $2.90. As I said, I love taro. 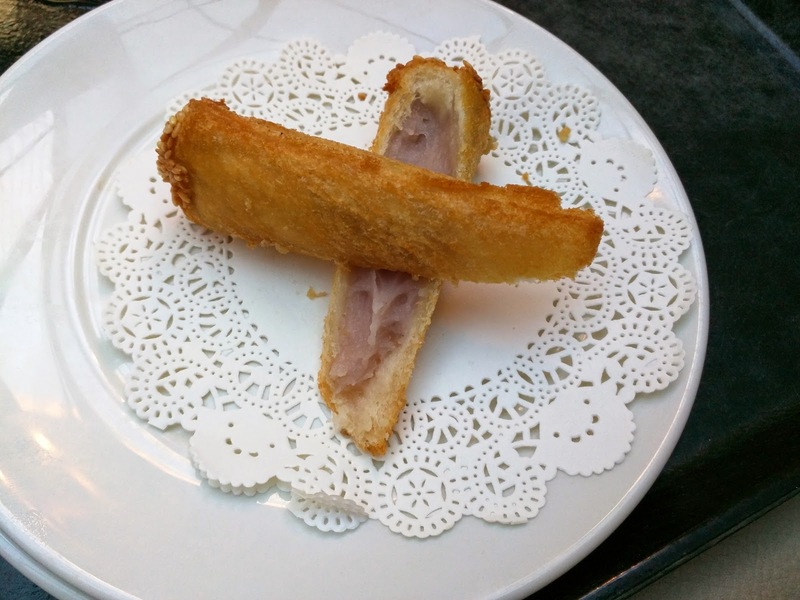 I was thrilled to see a number of dessert choices featuring taro, including the "golden taro bread", which I wasn't entirely sure what it was going to be, but it sounded great. Except, it wasn't great. The dough was way too oily, and just tasted like oil. The creamy taro inside was nice enough. But ... meh. $2.90 for the pair was reasonable, and they were hot and fresh, just, too oily.